The well is located in St Anne's garden on the southside of the road from the old parish church. 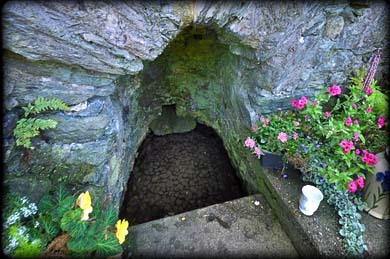 The well is situated at the base of St Anne's Grotto. In the centre of this peaceful setting is a small pond formed by the water from St James Well. The water from St Anne's well runs along a small channel to the east where it meets the water from another channel that runs from the pond. 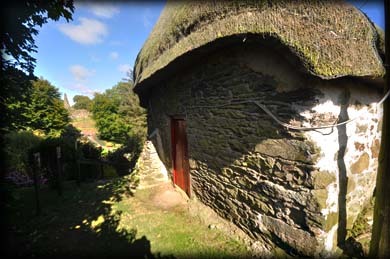 To the right of the grotto there are stone steps that lead up to a small thatched building that was used as a mass house during penal times. A pattern takes place here on the 26th July, St Anne's day, each year. The image above was taken from the well looking north towards the old graveyard. Below right is a pic of the mass house, that was built up against the interior wall of a ruined tower house. I was delighted I visited when the garden was in full bloom. Situated: Take the turn facing St Anne's Church in the centre of Tomhaggard village. St Anne's Garden is on your right opposite the old graveyard. Discovery Map 77: T 0293 0811. Last visit Aug 2015.